Kif Kehlmann, a young, penniless writer, thinks he’s finally caught a break when he’s offered $10,000 to ghostwrite the memoir of Siegfried “Ziggy” Heidl, the notorious con man and corporate criminal. Ziggy is about to go to trial for defrauding banks for $700 million; they have six weeks to write the book. But Ziggy swiftly proves almost impossible to work with: evasive, contradictory, and easily distracted by his still-running “business concerns”—which Kif worries may involve hiring hitmen from their shared office. Worse, Kif finds himself being pulled into an odd, hypnotic, and ever-closer orbit of all things Ziggy. As the deadline draws near, Kif becomes increasingly unsure if he is ghostwriting a memoir, or if Ziggy is rewriting him—his life, his future, and the very nature of the truth. By turns comic, compelling, and finally chilling, First Person is a haunting look at an age where fact is indistinguishable from fiction, and freedom is traded for a false idea of progress. 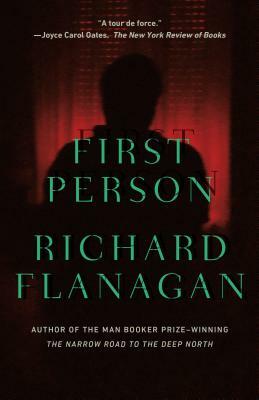 RICHARD FLANAGAN's novels, Death of a River Guide, The Sound of One Hand Clapping, Gould's Book of Fish, The Unknown Terrorist, Wanting, and The Narrow Road to the Deep North, for which he was awarded the 2014 Man Booker Prize, are published in 42 countries. He lives in Tasmania.